Today I finished my Eyelet-Cable Socks. 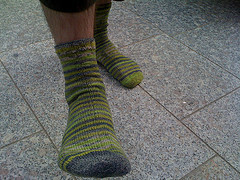 It is a simply sock with an off-center cable at the side of the sock. It is hard to see in the pics, but there are eyelets in the cable itself. 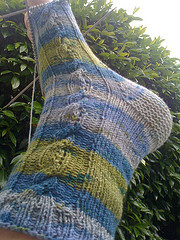 For the socks I used size 2,5 needles (US size 1 I think) and a very stretchy sock yarn called Lana Grossa Meilenweit Point Stretch. Cast on 60 stitches and work about 10 rounds of k2, p1 for the ribbing. My Elphaba pullover is finally finished and it turned out great!!! 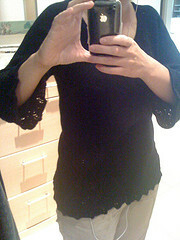 Unfortunately it’s too warm here at the moment to comfortably wear a knit pullover for more than a few minutes at a time. But I of course tried it on and it actually fits. 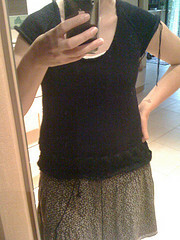 Well it’s maybe a tiny bit too big, but that doesn’t really matter as I usually wear something underneath anyway. Can’t believe it’s been more than a month between my last post and this one! June really did fly by! As y’all can imagine I’ve done a lot of knitting in the past month and there is lots to show off again. First of all I started a “big” project again! Of course I also have a couple of socks to show off. In the first pic are the socks I started way back in May. I finally got them done last week during a rainy afternoon while watching several episodes of Game of Thrones. K. loves them. And here is another pair. 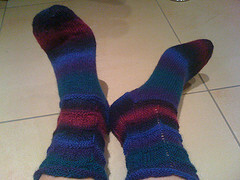 I knit those during a longish train ride to V. on the Pentecost weekend, when I visited N. The pattern is from ravelry and is called “Overkill- Socks”. I loved the pattern, but if I should ever so them again I’ll definitely use a different yarn. The yarn was absolutely awful to knit with (though the colors are simply beautiful) and I’m pretty sure it will felt dreadfully when I wash them for the first time. It already did during knitting and so I never even dared to block them. Ugh! 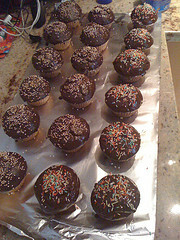 Just to prove that I occasionally do something else than knitting too, here is a picture of the cupcakes I baked today. At the moment I’m totally into cupcakes. Today I did a batch of yummy nut-coconut ones and another with just lots of choc. Yum! I know that there should be some kind of cream on top, but I prefer them with just a little bit of choc as a topping.